I needed a good low carb recipe to take to a family gathering. I wanted to at least bring a dish I was able to consume, knowing almost everything else would be super carb laden. I made this dish a day before I needed it and I am sure it tasted better because of it. This salad was a huge hit and everyone raved about it. This would also be a great side dish to serve with Chicken or Fish. I first blanched the asparagus in a large pot of boiling salted water for 1 minute. Next I placed it in a ice bath the stop the cooking process. 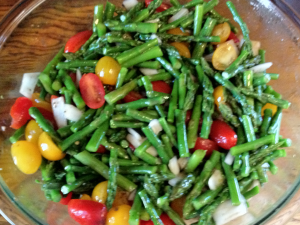 After the asparagus is cooled put into a large bowl and toss with the rest of the ingredients. Cover and refrigerate for 12 hours before serving. This will makes about 12 servings. According to myfitnesspal.com this recipe has 54 calories, 7g of carbs, 3g of fat, and 1g of protein per serving.